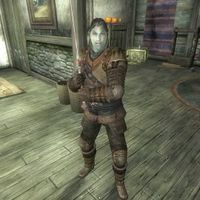 Kylius Lonavo, a hostile Dunmer rogue, is the boss of a skooma trafficking ring based out of Greyland, a small settlement located west of Leyawiin. The Legion wants him brought to justice, and you will be tasked with taking him out during the related quest. Lerexus Callidus will fill you in on the reason he wants Lonavo taken down: "A small group of Skooma dealers led by a Dunmer named Kylius Lonavo is holed up in the Greyland Settlement just up the road. I've been trying to catch Lonavo for months, but every time I approach the place, his lookout sees me and he goes running. I need someone to go in there and put a stop to those fetchers. I don't care what it takes. We must get that poison they're selling off the street. Bring me Lonavo's ring as proof he's... been dealt with... and I'll give you the bounty on him." He also offers you two pieces of advice: "Be vigilant. Lonavo is a snake." and "Don't turn your back on Lonavo for a second. He wouldn't think twice about burying his blade there." He wears a full leveled set of light armor, excluding the helmet and the shield, which will always be the best quality possible for your level. He uses an enchanted claymore. He also carries his ring and a large amount of gold. In combat he uses a major leveled Illusion spell (Chameleon, Invisibility or Silence). Lonavo spends his time aimlessly wandering around inside the house at Greyland, never eating, sleeping, or unequipping his gear. He will occasionally chat with the generic respawning Marauder who also inhabits the house. Despite what Lerexus Callidus will tell you, Lonavo has no lookout and won't run off if you approach the settlement. He will attack you as soon as he detects you.